Capital High School seniors Matt (left) and T.J. Mickelson (right) are off to a strong start for the basketball season. Photo credit: Grant Clark. One of the state’s best scorers, T.J. Mickelson, hasn’t taken a shot during the final 20 minutes or so of practice. 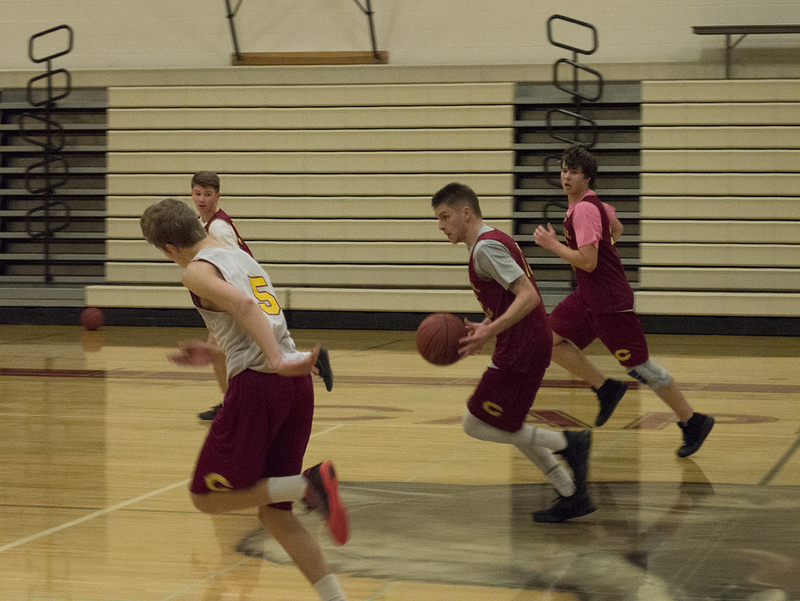 The senior is all about distributing the basketball in this full-court five-on-five scrimmage. Most of the passes have plenty of style to them, a pretty no-look pass in the lane is followed by a near half-court bounce pass from the 6-foot-1 point guard that perfectly finds its streaking target for an easy layup. T.J. looks about as comfortable as he’s ever looked on the court, and there’s a big reason for that. His brother, Matt Mickelson, is on the receiving end of several of his assists. It’s a scenario neither believed would ever take place in high school – both brothers playing on the same team with dad, Troy Mickelson, serving as an assistant coach. T.J., who is the older of the two by 11 months, and Matt are both seniors Capital High School, playing their last year of high school basketball. It’s the first time since eighth grade they have been on the same team. Three years ago, as freshmen T.J. opt to enroll at Black Hills High School, while Matt became a Cougar. T.J. flourished during his first three years of high school as a member of the Wolves basketball team, averaging approximately 25 points a game during his time at Black Hills High School while becoming a two-time 2A Evergreen Conference MVP and Associated Press All-State selection. T.J. Mickelson guards the ball while his brother Matt plays defense directly behind him. Photo credit: Grant Clark. But something was notably missing despite all the success. 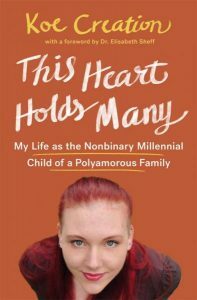 That feeling stretched across the entire family. 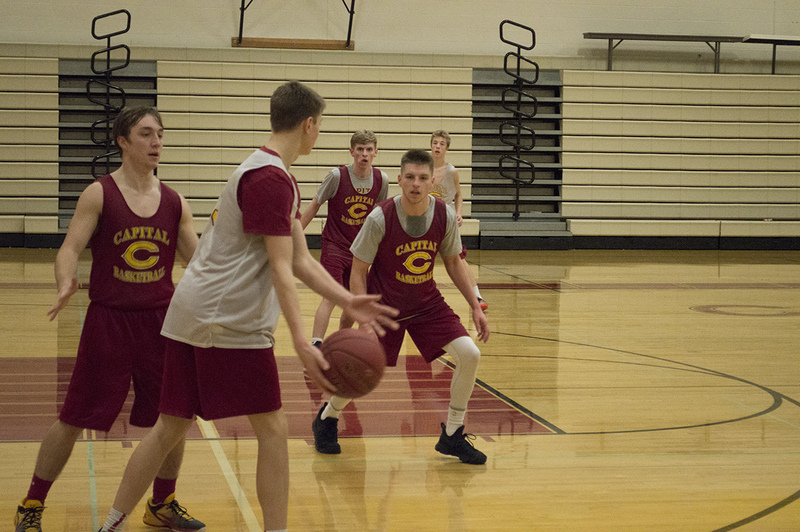 Troy, a teacher at Capital and former head basketball coach, took an assistant coaching posting with the Wolves, while the boys’ mother was forced to decide which game she would attend during frequent conflicting schedules. 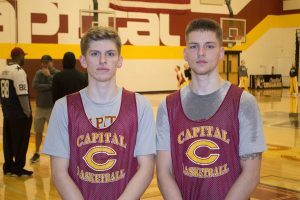 That all changed in early October when T.J. made the decision to transfer to Capital and re-join his brother for their last year of high school. T.J. Mickelson was a two-time 2A Evergreen Conference MVP at Black Hills High School before transferring to Capital High School this year. Photo credit: Grant Clark. And the Cougars are off to one of their best starts in recent years because of it, opening the season by winning six of their first seven games, including posting a perfect 4-0 mark in the newly formed 3A South Sound Conference play. It was as if that three-year hiatus did little to change the relationship between T.J. and the teammates he grew up playing with as the squad clicked on the court from the jump. 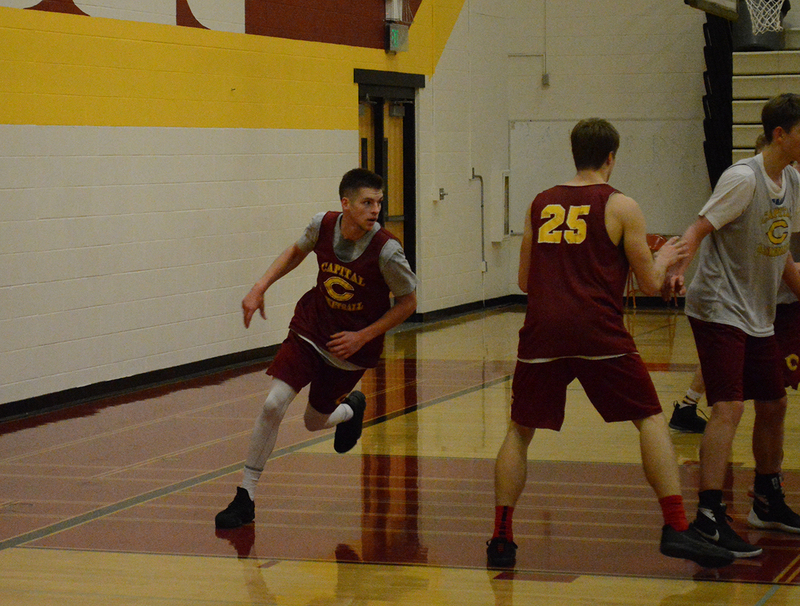 T.J. Mickelson brings the ball down court during a Capital practice. The Cougars opened the season with six consecutive victories. Photo credit: Grant Clark. And while the Cougars are piling up victories with their new lineup, it is actually secondary to what the Mickelson family is getting out of the experience.